Home Beverages A GOOD DAY FOR A CUP OF HOT COCOA? One serving of Wondercocoa has 1 net gram of carbohydrate, no fat, and it is 99.7 % caffeine free. The label states that the fat is removed by mechanical pressing. If you use Wondercocoa™ and liquid sucralose, a rich, creamy, cup of cocoa is almost a freebie! Combine the cocoa with a small amount of the water and mix to a smooth paste in a microwave-safe cup or a small saucepan. Stir in the rest of the water, the cream, sweetener, and salt. Heat in the microwave for about 1½ minutes or on cooktop until hot. Stir in vanilla. Top with sugar-free Whipped Cream and dust with cocoa powder or sprinkle with orange zest, if desired. Makes 1 serving of 1 cup. Replace cream and water with Hood Calorie Countdown Milk® (add 3 net grams of carbohydrate for a total of 4 per serving). 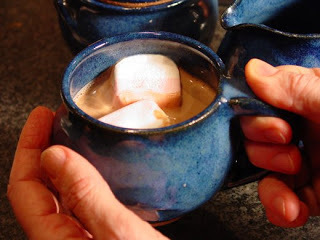 If you prefer marshmallows in your cocoa, try La Nouba® sugar-free marshmallows. They are sweetened with maltitol, but they taste and melt like regular marshmallows. Hot cocoa, La Nouba, Wondercocoa. Bookmark. This is not just hot chocolate but it sounds like hot chocolate on growth hormone! Me too, Henzy. I just got back from Mexico where it was 80+ and it’s cold and snowy here. I think I’ll go make some right now! help. I have a can of wondercocoa but don’t remember where I bought it. In Seattle. I have searched pcc, trader joe’s….websites and looked at QFC…Can someone steer me in the right direction?